It’s that time of year again – yes, summer is finally here, and with it, the promise of a busy couple of months for our catering services. Being a hog roast company, one of our most popular requests at any time of year is, of course, our fantastic hog roast, and that’s just what the doctor ordered over the weekend. Dr Mills is a retired GP who recently called us to ask about our party catering service as he wanted a hog roast in Nateby. Despite being retired and never having a practice here locally, he still goes by the doctor title, and why not! Dr Mills had been recommended to us by a family member who had enjoyed our services in Scotland. Wait – Scotland? Well, you may not know this but we actually have depots all over the UK – strategically placed depots with teams of dedicated staff who are all locally aware. 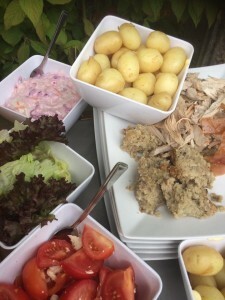 We have customers who have enjoyed our food at a wedding in London and then at a birthday garden party in Cork and later in the year at an engagement do in Manchester! One of our clients actually once said that we are a national treasure. I may be biased but I tend to agree! So, back to Dr Mills, who was keen to try out our food and in particular host a hog roast in Nateby at his home, which he had always wanted to do but never had time when he was a GP. This event was to be his ultimate retirement party (he’d already had one when he retired 5 years ago but wanted an excuse for a party in his garden!). We talked through the menu options and he decided on our Private Party Menu 3, which is ideal for many kinds of events. Hawaiian Hog Roast in Rishton!